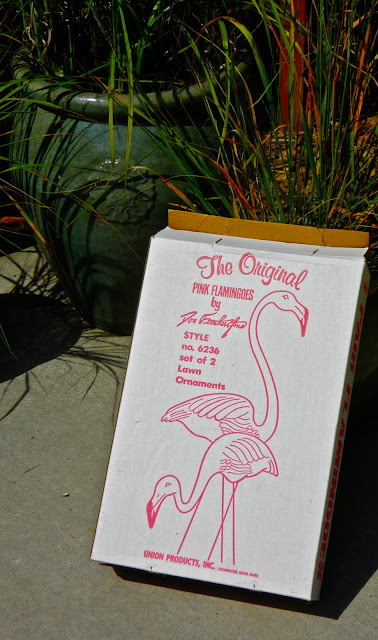 From Captain's Daughter to Army Mom: Featherstone Flamingos together by the Pool! If not, you're probably thinking white-trash! little flamingo he lost, and why they became separated, was a tear-jerker! Where we hope they'll live Happily-ever-after! Speaking of happy... The blue bird pair are still very busy tending their nest! 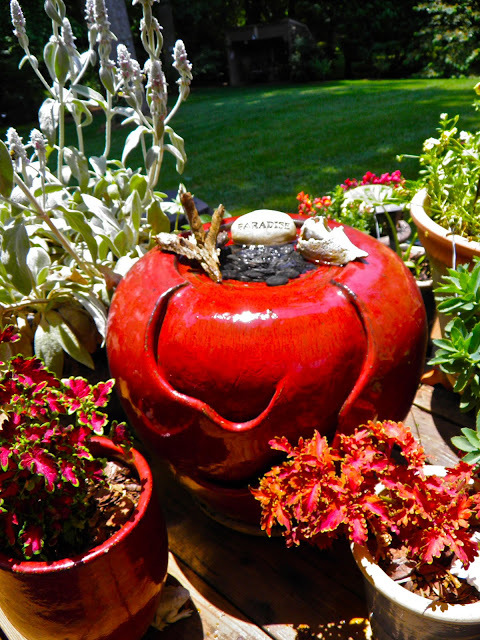 installed an outlet for my fountain on the deck! thing is the loud echo his ribbitts make! Who wouldn't be happy in that beautiful place. 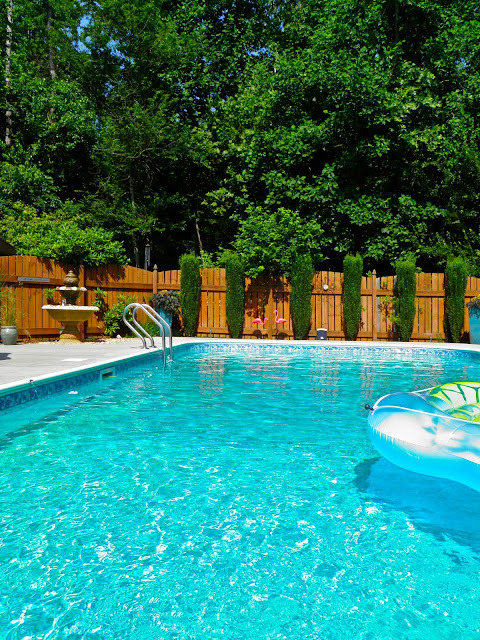 You do know they have a tendency to multiply right (jk) Love your pool and area. 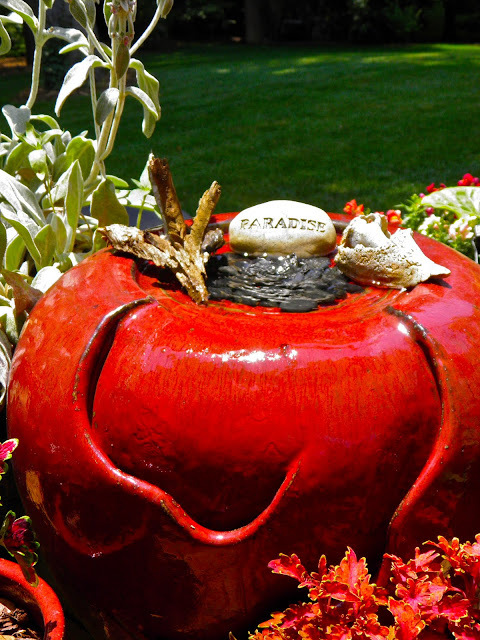 Your water feature has me chomping at the bit to replace the pump in my large pond pot. Haven't seen the movie,but I just put it on my list. 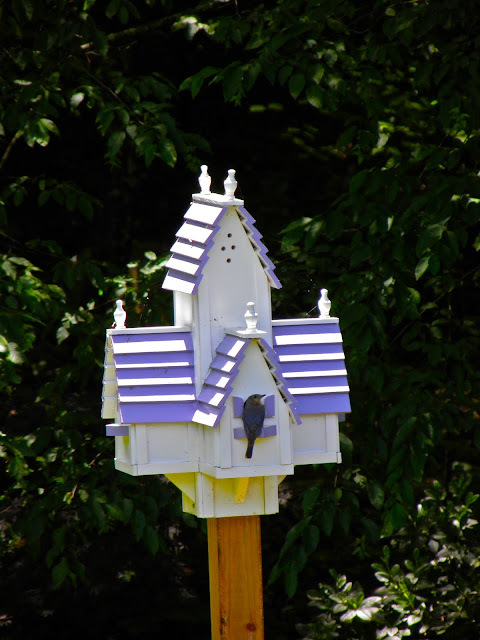 Pretty blue bird and I love your birdhouse! I haven't seen the movie yet but I do see your gorgeous tan! Lucky lady. Glad that the *forgotten flamingos made it poolside. I think they look great. P.S. That *paradise* stone couldn't be anymore appropriate! What a lovely looking pool and yard you have. White trash...hardly! I love the flamingo's! Nice touch to a very pretty area. Enjoy your summer! There's a garden center here on a hilltop that sells the pink flamingos and their lot is covered in them. I think they're fun! In the winter they replace the flamingos with penguins. LOVE.